This is going to be a super short blog post but I wanted to put it here instead of on Instagram so that those looking for it could easily search for it and find it whenever they need to! My husband and I have just started on our second gallon of this homemade laundry detergent and it's been great! Its an extra $12-$15 that we don't have to spend every time we run out of detergent and is 100% safe and non-toxic and does not stain, fade, or make your clothes feel weird! Honestly, our clothes have never felt so clean and smelled so good! My husband is a sweaty guy y'all and this detergent cuts right through it and leaves his clothes smelling better than they ever have without having to use the crazy harsh detergents. Like most of my recipes and diys, I research and find something I like and then tweak it and customize it to our needs. For a while I was using the fragrance free gentle detergents that can be found at target but honestly, I like a little fragrance left on my clothes. I love the clean laundry smell and we went a few months without fragrance and without dryer sheets altogether so I was missing it! When I first made this recipe I was skeptical. I'm the kindof person who likes their clothes to be CLEAN. For the first few weeks of using this detergent I was putting everything to the test. Smelling it myself, having others smell it, washing things on cold, warm, and hot to see what the differences were and if it would clean all the dirty dish towels, mop pads, my husbands "lawn mowing" clothes, etc. I had heard some talk of clothes fading when you use homemade detergent so we tested that out for a little over a month as well and this stuff stood the test of time in all aspects! I love the freedom of being able to make our household necessities and not having to postpone laundry day because we ran out of soap. I also just wanted to add in here that the detergents out there on the market that claim to be "all natural" or "chemical free" can be very very deceiving. Mrs. Meyer's is not as great as it seems. Method and Seventh Generation used to be my go-tos and while neither are terrible, they are still full of unknown ingredients but marketed to look totally safe! I am starting to believe that the only way to make products that are truly clean and non-toxic is by doing it ourselves. So give this one a try! It's super easy, I promise, and you probably have everything you need in your pantry or bathroom already! 1 Gallon sized container or jar - this is the one I use! 1 Cup castile soap - I use this peppermint one! Step 1. I always bring 4 cups of water to an almost-boil over the stove. I then take the pot off of the heat and start stirring in the baking soda and salt. This is the most time consuming part of the process because you really want to make sure the baking soda and salt is dissolved. If your water is not hot enough, put it back on a low-medium heat and stir until dissolved. Step 2. Add your soap! I always just add everything into the same pot. 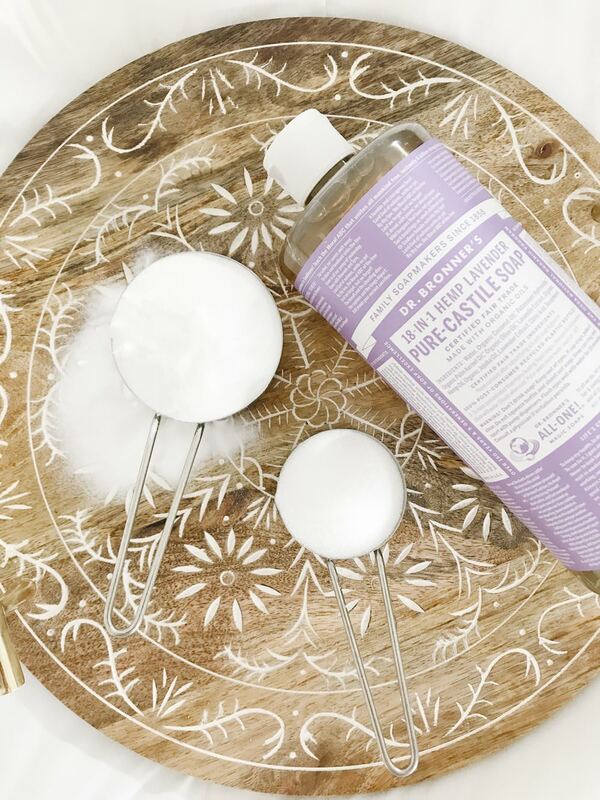 I love using the lavender castile soap because it adds such a nice scent to the detergent. After I stir everything together and make sure it's all dissolved, i'll pour the mixture into the gallon jar. Step 3. Once your mixture is in your jar, you'll have a good bit of space left so start to slowly fill the rest of the jar with water, doesn't matter if it's hot or cold. I just use a luke-warm tap water for this part. Your detergent may start to foam a bit but that's ok! Just continue to fill your jar with water until most of the jar is full of liquid. At this point I usually add in a few drops of lemongrass essential oil as well! If you are interested in ordering essential oils or learning more about them, I am actually a doTERRA wellness advocate and would love to help get you started! Step 4. You're done! How easy was that? I use 1/2 cup of detergent per load of laundry and if the detergent looks like it's separated a little in the jar just give it a quick shake. Now it's time to do some laundry and test out your new detergent! Be sure to let me know what you think! I hope you love it as much as I do! Tonight i'll be making my own dishwasher tablets so stay tuned for another recipe!